SAN FRANCISCO, 6th of November 2018 — Trifacta, the global leader in data preparation, today announced new additions to its existing support for the Microsoft Azure ecosystem as part of the latest release of Trifacta’s Wrangler Enterprise data preparation platform. Most notably, Trifacta is now integrated with Azure Databricks Apache Spark™, which extends Trifacta’s support for Apache Spark™ across on-premises and cloud platforms. With the addition of native support for Azure Databricks, Trifacta users benefit from the faster deployment, autoscaling workloads and native integration with Azure services that Azure Databricks provides. With this announcement, Trifacta solidifies its position as the data preparation platform with the broadest support for Azure. Of the major cloud providers, Azure is recognized as the fastest-growing cloud with a growth rate as high as 98% over the past 12 months. As a greater number of analytics workloads migrate to the cloud, Trifacta, in turn, is seeing increased demand for scaling data preparation processes on Azure. 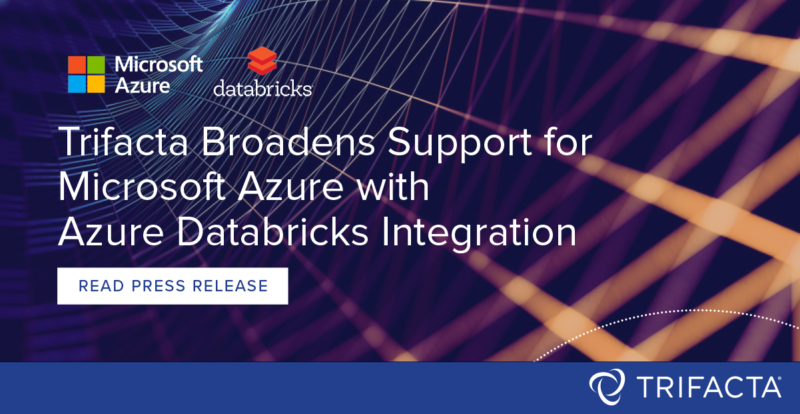 The added support for Azure Databricks gives customers greater efficiency, scale and performance in running data preparation workloads on the Azure platform. Trifacta’s expansive Microsoft Azure data services ecosystem support includes the availability of Wrangler Enterprise in the Azure Marketplace, as well as existing support for deployment on Microsoft Azure HDI and integration with Azure Blob Storage, Azure Data Lake Storage, and SQL Data Warehouse. Trifacta is also included in two packaged solutions recently launched on the Azure Marketplace: “Customer 360º,” a complete platform for Customer 360 workloads that is led by consulting partner Bardess Group; and “Credit Analytics,” led by consulting partner RCG Global Services for credit risk analysis. Learn more about Trifacta’s integration with Azure Databricks here and its partnership with Microsoft Azure here.